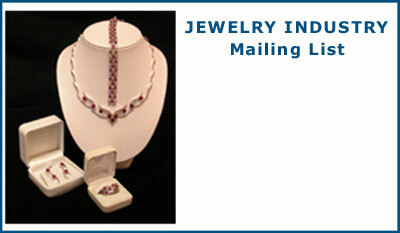 Jewelry manufacturers, jewelry wholesalers, pawnbrokers & much more. Read more information now! We also offer specialized lists including brand new businesses or "growing" businesses, as well as the ability to select or omit corporate headquarters, subsidiary headquarters, branch locations, franchises, public vs. private companies, government offices and more. In addition, we are able to provide any direct response list that is commercially available, including book buyers, magazine and newsletter subscribers, seminar attendees, many association membership lists, web site registrants, and other "self-reported" lists. The vast majority of these lists are fully commissionable which means that our clients do not pay an additional penny to utilize our services as opposed to working with these list sources directly. And in the process, we save our customers countless hours of research, ensure the timely delivery of all lists, assist with list response tracking, and serve as a single source for invoicing. Ready to get started? Click on Contact Us and complete our brief form, or feel free to call or e-mail adam@mailinglistsinc.com with your questions or specifications. In short, let us know who you would like to target; chances are, we can! Finally, we have direct access to any commercially available response or self-reported list. By segmenting based on magazine subscriptions, product purchases, web site registrations, surveys/questionnaires, product warranty cards, and other response devices, we are able to provide all types of lists based on interests, hobbies, product ownership, financial behavior (including various types of investor lists), cause-related contributions, and more. Contact us now about our Consumer Lists. Mailing Lists, Inc. gives me one less vitally important thing to worry about; namely, the quality of our data. Often, our target audiences go well beyond the easy-to-find names of business owners and presidents. Simply put, Mailing Lists, Inc. finds us the names of decision-makers and influencers we are interested in reaching regardless of job title or industry. Direct marketing definitely works for Raffa, P.C. Jimena Ryan, Director of Marketing, Raffa, P.C.